For the vocalist, performer, and public speaker, the Line 6 XD-V55 handheld digital wireless system provides the same clean, clear, and ultra-reliable performance as the XD-V75 system, but in a more affordable, more compact setup that's simple to setup and to use. Switch among 12 channels on both the mic and the simple-to-operate receiver. 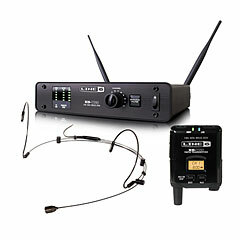 Roam the stage knowing that you'll sound without dropouts, RF interference, or noise, with up to 300' of range. Digital Channel Lock technology prevents reception of audio interference from other 2.4GHz transmitters. The XD-V55 features digital reproductions of four live vocal microphone models to optimize the sound of your performance. Touch a button on the XD-V55's transmitter to select a model to fit your voice and venue. The 12 available channels on the XD-V55 wireless system operate in the 2.4GHz band, free from interference from TV broadcast and cell phones. Use up to 12 channels simultaneously. These channels are available to use anywhere in the world, license free. You won't find this functionality on any other wireless system, and if you're planning an international tour this is your only alternative to having to source a wireless system in each specific country.